We no longer have pigeons in Silver Lake. We have rock doves. Indeed, there was one on the sun deck. Just one. Very selective, our rock doves. The elite. Not like the mobs of pigeons you’d see in the Ralph’s parking lot, waiting for the crazy bird lady. But Ralphs is gone, the bird lady is gone, and the pigeons are gone, who knows where. There are other parking lots, other bird ladies. So there was just the one rock dove, gleaming after a winter’s rain. He landed on our sun deck with its million dollar view, and the mere mourning doves and finches and sparrows scurried out of its way. The rock dove carefully selected only the choicest seeds, looked about, and then, tired of slumming it, flew off to the rich people in the hills, where he can find a finer selection of avian cuisine and bird baths sculpted in Carrara marble. Meanwhile, back on our sundeck the mourning doves and finches and sparrows rushed back in, bickering, pecking, a disorder of tiny dinosaurs with no class at all. Gentrification has a long way to go among these birds. 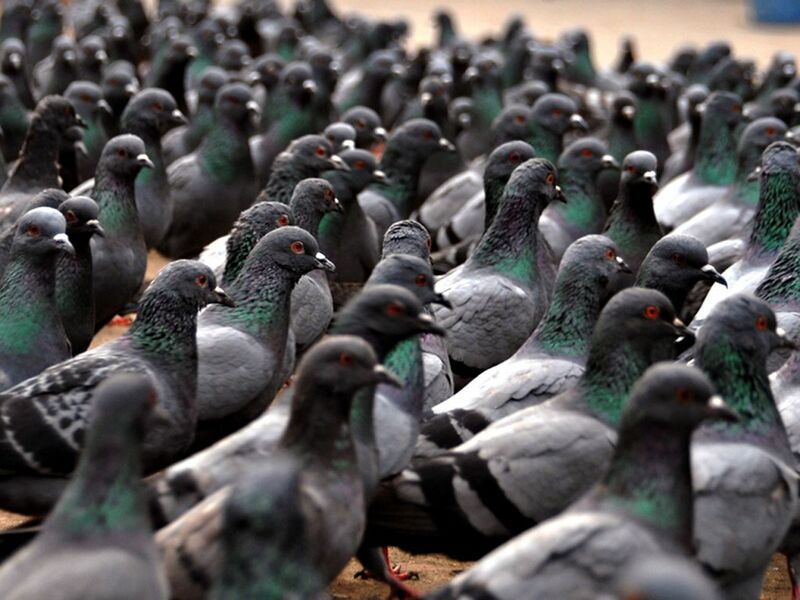 A hoi polloi of pigeons, unwilling to realize their inner rock dove. This entry was posted in Autobiography,memoirs and confessions, Greater L. A. hipsterpolitan region, Story telling and tagged birds, gentrification, pigeons, rock dove, Silver Lake, Silverlake. Bookmark the permalink.